In June 2008 the European-wide 'JuniorVoting' network was founded in Strasbourg. Alongside the European Election in 2009 more than 2 million adolescents will be participating in pupil elections. This is the largest school and youth project in Europe! Organisations in Europe are invited: Be a part of JuniorVoting! 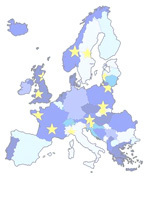 JuniorVoting aims at a creating a European network of and close cooperation between all institutions and organisations that are implementing the JuniorVoting project in their countries alongside the European Election 2009. JuniorVoting is not an election: it is a project for political education. This is backed upped by scientific research results like voter participation amongst parents increased by 4% on average, at times even up to 9%! European Network 'JuniorVoting' founded at the NECE conference in the European Parliament: 2 million adolescents participating!